Today we have Christa here from Christa Quilts! Since we love quilting here at DIY Crush we want to bring you some fun insights on Christa’s business. 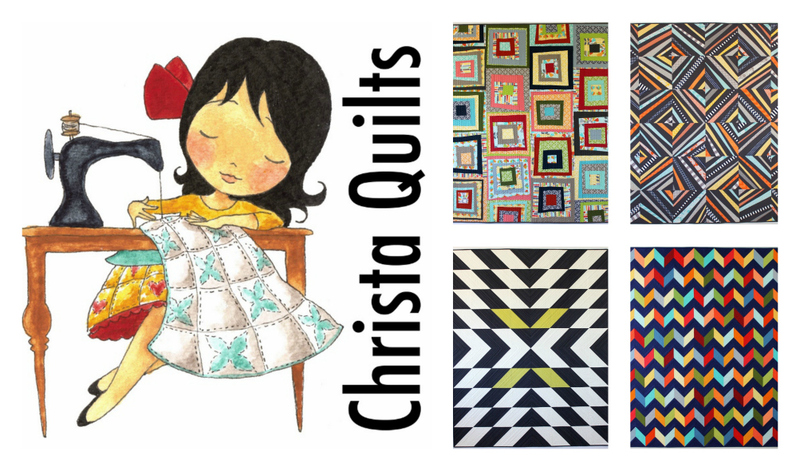 We were lucky to interview Christa so here are the fun facts about Christa’s Quilts! Take a peek at some of her designs in the banner above. Top row, right: Spiraling Out of Control – Probably her favorite quilt. It was featured in the Modern Quilt Showcase at Int’l Quilt Festival and will be shown again at QuiltCon in 2015. No pattern yet, but she is working on one and developing a workshop around it. Bottom row, left: Modern X – a pattern she designed for members of the Modern Quilt Guild – also available as an independent pattern. 1. Christa, when did you start quilting? I started quilting back in 1994 as a newly married college student. I thought it was the best thing ever! 2. What other crafts do you love to do? Nothing – just quilting. I tried nearly other craft until I hit upon quilting and that one stuck. 3. Do you have press releases or got featured in magazines, if so what are they? Yes, my first published design, Colorful Chevrons made the cover of Quilty in November, 2013. I’m also a current columnist for the National Quilting Association’s Quilting Quarterly magazine, writing about machine quilting (my favorite technique). I’ve also been a featured guest on several podcasts: American Patchwork and Quilting Radio with Pat Sloan, The Modern Sewciety Podcast and Me Being Crafty. My first book, “Machine Quilting With Style” will be published this August from Martingale/That Patchwork Place. 4. What can you suggest a brand new quilter to make their start easier? What would be your final words to close this fun interview with? Although I’ve never met a quilt I didn’t like, modern quilting is my favorite style. I feel like I struggled for years trying to find my voice in the quilting community. When I discovered modern quilting and attended the first QuiltCon, I could finally pinpoint what I liked, and I’ve been making up for lost time ever since!